ABSolute Equestrian - ABSolute Equestrian Pilates - Identify and correct your personal biomechanical problems to correct your riding posture issues. It's NOT a fitness program, it's a solution for you and your horse! ABSolute Equestrian Pilates...is about getting to the root of your riding positioning problems and fixing them. For the best experience for horse and rider, we must create a custom partnership a duet in which both horse and rider are at their best, athletically and biomechanically. Regardless of your riding discipline, these are the things you ask of your horse. In control of your muscles? Able to bend without collapsing? Identify and correct your personal biomechanical problems to correct your riding posture issues. And therefore many of your horse’s issues as well. ACHIEVE deeper levels of core strength for a more independent seat and a more relaxed and responsive horse. IDENTIFY AND CORRECT muscular imbalances that impede your riding. ISOLATE AND STRENGTHEN core muscles to “reprogram” your self - carriage both in and out of the saddle. CREATE SUPPLE STABILITY by opening your hips, stabilizing your shoulders and arms, and supporting your spine. How it Works & Pricing to edit. 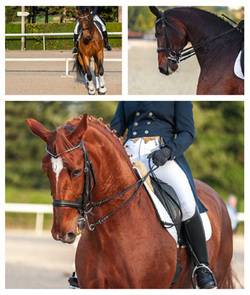 "ABSolute Equestrian Pilates is improving my riding HUGELY! Not only is my body more under my control, but my stamina is MUCH greater. We were both happily impressed!" "Contrology is not a system of haphazard exercises designed to produce only bulging muscles. ... Nor does Contrology err either by over-developing a few muscles at the expense of all others with resulting loss of grace and suppleness. Rather, it was conceived to limber and stretch muscles and ligaments so that your body will be as supple as that of a cat and not muscular like that of the muscle-bound body of the weight lifter." 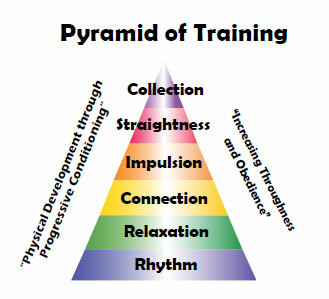 "Contrology is complete coordination of body ,mind and spirit. Through Contrology you first purposefully acquire complete control of your own body and then through proper repetition of its exercises you gradually and progressively acquire that natural rhythm and coordination associated with all your subconscious activities." My own experience is that if I could learn to ride from books, with my large library from all the experts, I would be a Grand Prix rider. There are also Pilates books on riding out there, but it is the same issue. Without a trained instructor who also rides and is taking the same journey as you, to actually show you what the biomechanical issues are with your individual body, help you find the correct muscles and form to use the Pilates machines and tools, you end up repeating the same errors with your body and strengthening already bad habits. Have you had the experience of your instructor telling you over and over to “get your shoulders down” or “keep your right leg back” or “do not slouch over” or “stop your hands from bouncing around”? You try, you achieve it for short time and then once again, the instructor is telling you the same thing again. Frustrating? Discouraging? Most times there are biomechanical issues behind these problems. Finding and strengthening the right muscles and stretching the overused muscles go a very long way to relieving your frustration as well as your instructors’. Joseph Pilates originally called his method Contrology and used the term Powerhouse for the core muscles , which include not only your abdominal muscles but also back muscles as well. It is not about tension or rigidity. It is the balancing and the connectivity of all your muscles throughout the body but yet the ability to isolate body movements. You learn to breathe properly for relaxation and use the energy generated in your body. He discovered ways to reach and strengthen the deep foundation muscles so the superficial layer (outside visible layer) could relax and not be in a constant state of tension. Muscles should be able to fire and react quickly and then release. The result TONE WITHOUT TENSION. Recovering from an injury or have physical problems? Joseph Pilates originally conceived Pilates as a rehabilitation program. The reformer provided clients with a safe , non stress method to correct muscle imbalances due to injuries. Since then dancers, gymnasts and all types of athletes avail themselves of this program not only to correct injuries but also to prevent future ones. Find release from the limitations of old injuries, lifelong biomechanical habits, and lack of strength and mobility with ABSolute Equestrian Pilates. With this specifically focused process of analysis, correction and rebalancing using the time-tested principles of Pilates, ABSolute Equestrian Pilates will empower you to achieve the results you are looking for. This efficient, low-impact, and minimal stress method will meet you wherever you are and lead you forward to your maximum result using a combination of machines (reformer, chair, and wall springs) and simple tools you can use at home and before and after you ride. ( Injuries and Special Populations) Pilates is also valuable to prevent injuries due to muscle strain and weaknesses or to relieve aching backs and hips due to riding. Are you ready to do your part in creating the partnership with your horse you have always dreamed of? Call 917.549.3254 today for a FREE consultation and trial session on the various Pilates equipment. For geographic convenience, I can make appointments at several other Pilates studios in both Fort Worth and Dallas as well as my own location. Attention Riding Instructors & Trainers! Looking for better communication tools to help your students? I can help pinpoint and strengthen the specific muscles / biomechanical actions which are necessary for your students to ride better. I can help make the desired changes and achieve the results you both dream of. Call 917.549.3254 today for a free consultation and evaluation!